Welcome to ChristmasTreesNow.com, the online home of Windblown Tree Plantation. 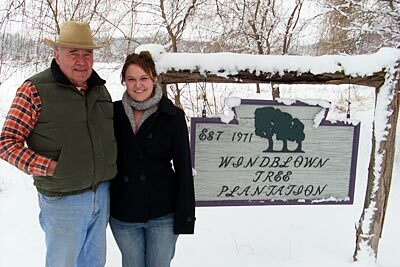 Here at Windblown Tree Plantation, my daughter Ericka and I are dedicated to providing you the finest in fresh cut Christmas Trees - shipped right to your door and the best landscaping trees grown in Wisconsin. Since 1971, Windblown Tree Plantation in Honey Creek, Wisconsin, has been growing and selling the finest, fresh-cut, Wisconsin Christmas Trees and landscaping trees ready for planting. We offer a wide selection of trees including Douglas, Balsam and Fraser firs - the "Cadillacs of Christmas Trees", the blue spruce and white pine. We grow over 24 varieties of landscaping hardwood and evergreens on our 150 acre home plantation with other growing locations located throughout Wisconsin. Wisconsin's unique soil and weather conditions are especially well suited for the growing of the finest Christmas and landscaping trees in America. Our fresh cut, mail order Christmas Trees will be immediately packaged and delivered to your home, church, school, office or other organization. You can order your Christmas Trees on-line, by fax or by calling our toll-free number. Watch Ericka Grow! See pictures of Wayne and Ericka across the years.